The floor-based 200 metre-square photo mosaic, the ‘Face of Suffrage’, is made up of more than 3,700 images of women. When the artwork is viewed from above, it shows Wolverhampton-born Hilda Burkitt – a leading face from the suffrage movement in the West Midlands. Evelyn Hilda Burkitt was born in Wolverhampton in 1876 and died in 1955. She was the first suffragette to be forcibly fed a total of 292 times and worked at the Birmingham Women’s Social and Political Union (WSPU) headquarters, near New Street station. She threw a stone at Prime Minister Herbert Asquith’s train as it pulled out of Birmingham New Street, after he attended a male-only budget meeting and she was imprisoned at Winson Green prison. Other women from the Black Country who are honoured include Emma Sproson, the first female councillor for Wolverhampton, who was part of the women’s suffrage movement, and Mary Macarthur, from Cradley Heath, who have both been honoured by posters on pillars in the station. 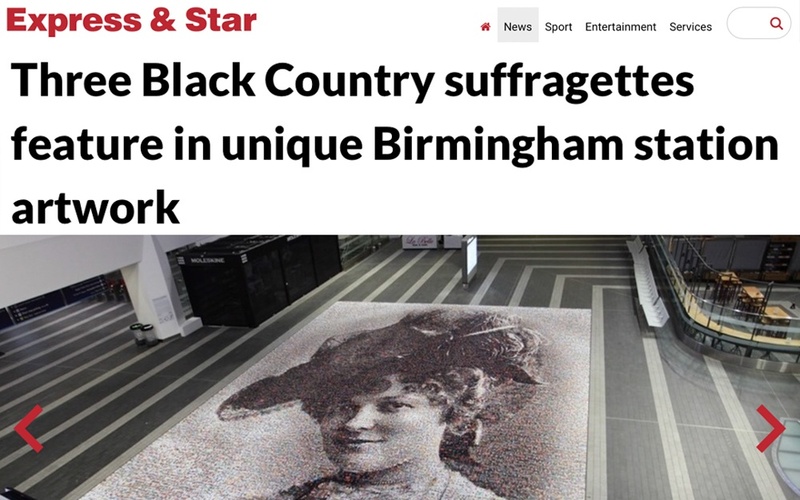 The image is made up of a combination of historical pictures of women from the West Midlands in the early 1900s and images of females today using photographs submitted by the public to be part of the commemoration. It was created by artist Helen Marshall, of the People’s Picture, who has installed similar projects across Britain marking other historic occasions. It will be viewed by up to 170,000 passengers every day at Birmingham New Street – which was chosen for its importance in transporting people to London in support of the movement. Ms Marshall said: “I really enjoyed creating this piece and I am indebted to the thousands of people who sent in their photos and those who helped me realise my original vision on a giant scale. “The photo is the face of a smiling Edwardian lady, but her story is far from what we might expect. “I spent some time researching women from the West Midlands involved in the fight for the women’s vote. Whilst all women have a daring and brave story to tell, Hilda’s was uniquely connected to the station and Birmingham.